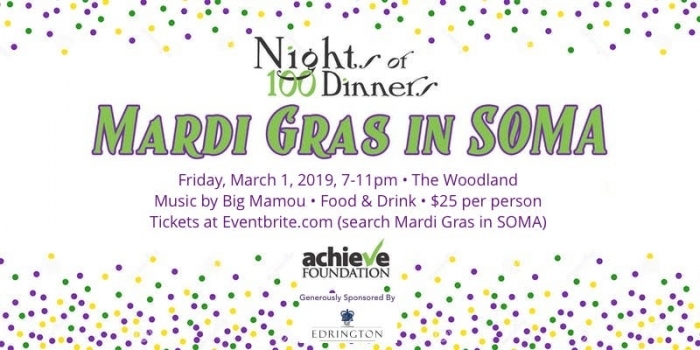 Kick off the Achieve Foundation's annual Nights of 100 Dinners fundraiser with a Mardi Gras party! The entire community is invited to an adults-only event sponsored by Edrington to celebrate the efforts of the Achieve Foundation to support SOMSD students and teachers. Music by Big Mamou and performances by CHS students! Admission includes food, one drink ticket, music and dancing. Additional drink tickets will be available for purchase. All proceeds of the evening will support the work of the Achieve Foundation. We are grateful to Edrington for allowing us to keep ticket costs low for this event.